2006-04-27 First worldwide family litigation filed litigation Critical https://patents.darts-ip.com/?family=7690025&utm_source=google_patent&utm_medium=platform_link&utm_campaign=public_patent_search&patent=US20040148425(A1) "Global patent litigation dataset” by Darts-ip is licensed under a Creative Commons Attribution 4.0 International License. 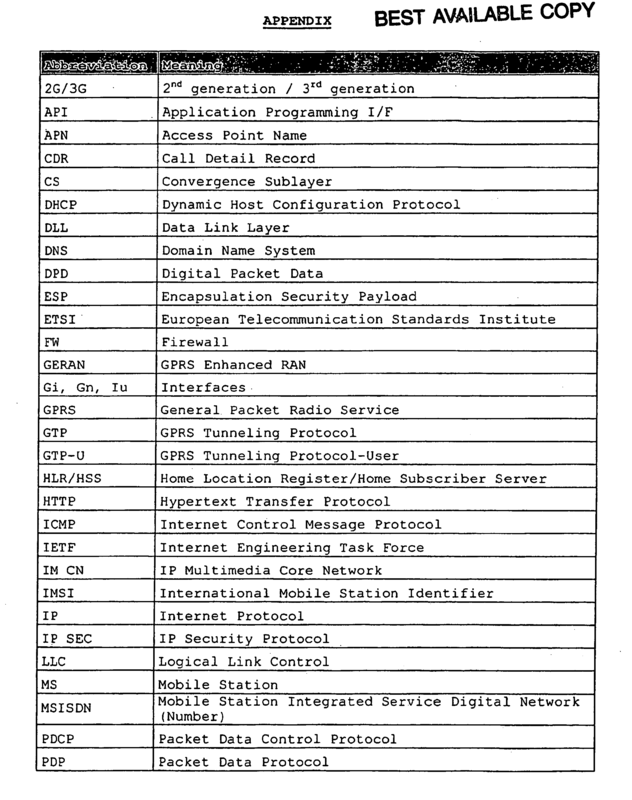 The present invention concerns a method for transmitting application packet data via a first packet data network between a terminal and a second packet data network, said application packet data being transmitted using an application protocol operated on top of a protocol stack, said protocol stack comprising plural individual stacke protocol layers adopted for said transmission within said first packet data network, wherein said application packet data are addressed to the terminal and distinguishable according to a service type implemented for said terminal using said application, the method comprising the steps of: detecting said service type, and dependent on the transmission direction of said application packet data, removing and/or adding at least one of said plural individual protocol layers for a specific one of detected service type. The present invention also concerns accordingly adapted terminals and network nodes. Subsequently, the present invention will be described with reference to such a GPRS network as an example. Of course, the chosen example is not intended to be limiting for the present invention and other networks different from the GPRS network may likewise be adapted to the present invention, i.e., the present invention is suitable to be implemented in various packet data networks. For example, GPRS networks are known to exist in parallel to GSM networks (GSM=Global Standard of Mobile Communication) as well as in parallel to UMTS networks (UMTS=Universal Mobile Telecommunication System). GSM networks are also referred to as 2G (2 nd generation networks) whereas UMTS networks are also referred to as 3G (3rd generation networks). For example, at the sending end, when represented by the mobile station and/or the terminal, the protocol layers according to GSM are stacked, from the lower layer to the upper layer, as follows: GSM RF Layer (radio frequency layer), MAC/RLC (media access control/radio link control), LLC (logical link control), SNDCP (subnetwork dependent convergence protocol), which all together form the packet domain bearer. 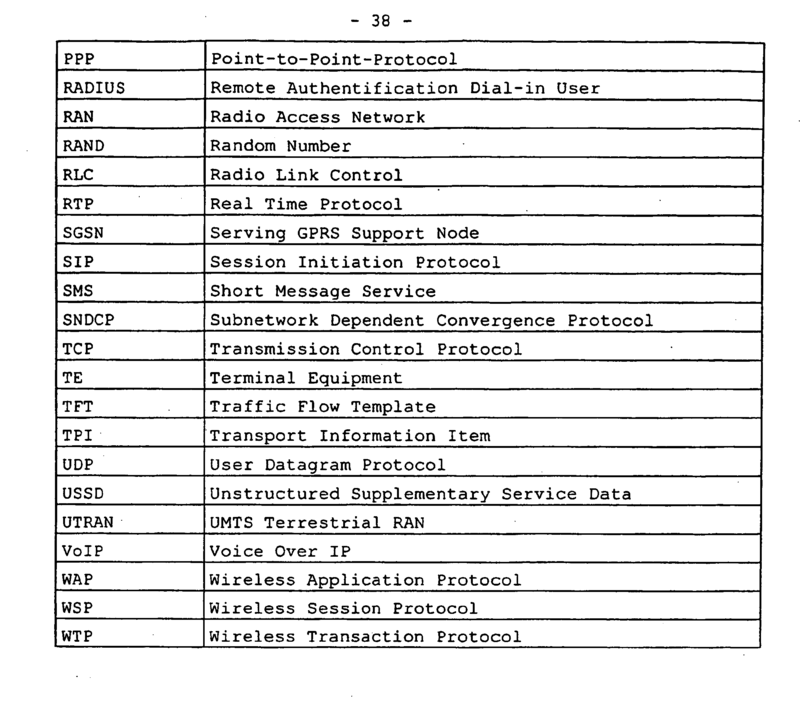 Correspondingly, in a UMTS mobile station, the protocol stack at the terminal is L 1, MAC/RLC, PDCP (packet data control protocol), which in summary form the packet domain bearer for UMTS (see also ETSI TS 129061 V.3.4.0 of September 2000, pages 10 and 11). In GPRS as well as in UMTS, there is a limitation that a PDP context containing the same address has to have the same PDP type. Namely, according to ETSI specifications, the secondary PDP context activation procedure may only be initiated after a PDP context is already activated for the same PDP address and APN (access point name). It is to be noted that the PDP address in terms of the used coding includes the PDP type. In addition, for certain services/applications such as WAP and/or SIP signaling, discovering the address of the application server is not easy. For WAP service, today the IP address of the WAP Gateway is preconfigured in the MS. For VoIP as foreseen by 3GPP, additional signaling is needed to allow the MS to discover the local SIP proxy (i.e. CSCF)IP address. Also, some network operators want to force the subscriber to use the network operator's own services (proxy server, gateway server). This implies that a restriction (such as FW (firewall), uplink filter such as TFT (traffic flow template)) is introduced concerning a location within the network, where the user may connect to the network for certain services. A current proposal for VoIP (voice over IP) in 3GPP (3 rd generation partnership project) resides in using a dedicated signaling PDP context with a new function in the GGSN to screen a destination address of packet data sent from this destination address and limit it to using uplink filters such as traffic flow templates (TFTs) only to an allowed one and/or to allowed ones. With particular reference to WAP the gain is partly in transmission speed in the order of 20 to 25 ms per WAP packet (28×8 bit/10 kbit/s=22 ms) so that if WAP transmission requires four iterations, the gain is about 100 ms. The gain is partly reducing the probability of retransmission. If a packet is sent with two radio link control layer blocks instead of three, the probability of having one of the blocks corrupted decreases. This is less significant, if IP header compression is used (overhead is then 2 to 4 octets). Also, the terminal mobile station could be more simple as it could have its WAP application run straight over GPRS/UMTS protocols (similarly to operating them over SMS (Short Message Service)). Less processing would then be required from the mobile station terminal. Also, a WAP gateway address would not be needed to be configured in the mobile station terminal. In an alternative implementation of a gateway node such as a GGSN, the benefits reside in less addresses needed for WAP users in the GGSN, a simpler WAP gateway node since the MSISDN (mobile station integrated service digital network number) could be added to WAP in an extension header instead of being stored in the WAP gateway. dependent on the transmission direction of said application packet data, removing and/or adding at least one of said plural individual protocol layers for a specific one of detected service type. removing and/or adding at least one of said plural individual protocol layers is accomplished by removing and/or adding header information related to said respective protocol layer. removing/adding at least one of said plural individual protocol layers is effected at a gateway node of said first packet data network to said second packet data network. in uplink transmission from said terminal towards said second packet data network, said at least one of said plural individual protocol layers is added. 5. A method according to claim 1 or 2, wherein adding/removing at least one of said plural individual protocol layers is effected at said terminal communicating via said first packet data network with said second packet data network. in uplink transmission originating at said terminal, said at least one of said plural individual protocol layers is removed. the service type is indicated by the terminal to a gateway node. the service type of an application is distinguishable from a context defined for said terminal and application. a context definition comprises service type, address information of a terminal for which said service is implemented, and a quality of service definition. filter information, application type information, destination address and type of header to be added. in case different applications in the terminal share the same address, the gateway maps downlink packets to the appropriate context using a filter mechanism. protocol headers to be added are determined from said context and/or configured information. selection means adapted to selectively remove and/or add at least one of said plural individual protocol layers dependent on the transmission direction of said application packet data, for a specific one of detected service type. 14. A gateway node according to claim 13, wherein said selection means is adapted to remove and/or add header information related to said respective protocol layer. to add said at least one of said plural individual protocol layers in uplink transmission from said terminal towards said second packet data network. said selection means is adapted to add protocol headers based on information from said context and/or configured information. wherein said detection means is adapted to distinguish the service type of an application from a context defined for said application. said detection means is adapted to select the appropriate context using a filter mechanism if different applications in the terminal share the same address. a context definition comprises application type information, address information of a terminal for which said service is implemented, and a quality of service definition. said detection means is adapted to select the appropriate context if different applications in the terminal share the same address. said activation means is adapted to establish one or many contexts in a gateway node. 25. A terminal according to claim 21, wherein said selection means is adapted to remove and/or add header information related to said respective protocol layer. to remove said at least one of said plural individual protocol layers in uplink transmission originating at said terminal. the context definition further comprises filter information, destination address, application type information and type of header to be added.